Uncover the tremendous potential that the Greater Bay Area offers, Carrie Lam tells Japanese business people in Tokyo today. 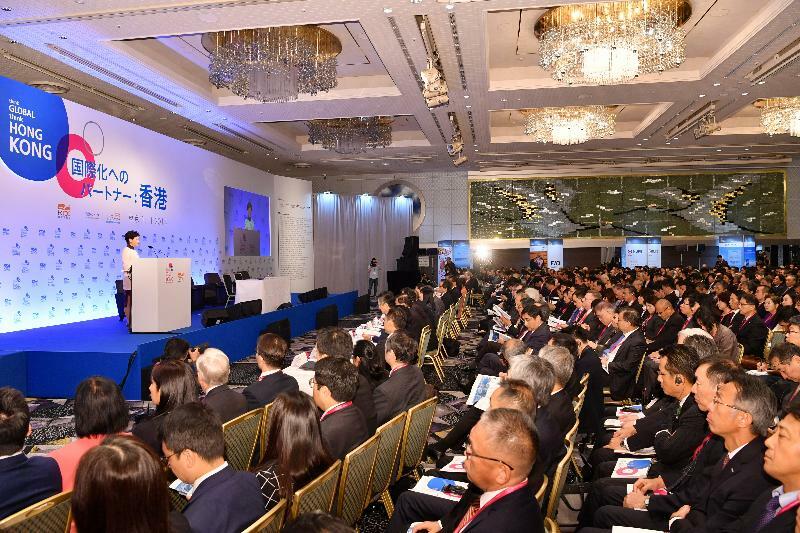 The Chief Executive, Carrie Lam Cheng Yuet-ngor, invited Japanese businesses today to explore the potential that lies in the Greater Bay Area. She was speaking at the 'Think Global, Think Hong Kong' Symposium in Tokyo. "For our friends from Japan, I would strongly recommend you to spend time to uncover the tremendous potential that the Greater Bay Area development may mean to your operations. I am sure you will find ample opportunities there,'' she said. "The development of the Greater Bay Area will allow Hong Kong to give full play to her strengths. And one of the ambitions in the Greater Bay Area is to develop an international innovation and technology center, which has the personal endorsement of President Xi Jinping.